Ou - En - Dan LINKs! Text is all in Japanese, but there are ton's of information for JASDF's F-4. Tons of photos are in bellow URL. Text is all in Japanese. This site's theme is JASDF F-2. "Viper ZERO" is a nickname for F-2. Text is all in Japanese. This site's theme is JASDF 501sq as known as "Woodpeckers". Woodpeckers is the only reconnaissance squadron in JASDF. New ! Sally-san, who is famous test pilot's page. Mr. harlock 's site. Many beautiful pics including Jet Fighters. Mr. HiROMu 's blog. He loves "Eagle head" 204sq and updating his blog with latest pics of F-15Js in Okinawa. Mr. "tokio" 's site. 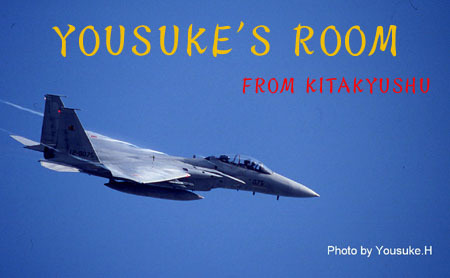 Check latest 204sq's F-15 photos moved from Hyakuri-AB to Naha-AB. Mr. "Motty" 's site. Many beautiful photos taken at around Fukuoka. Please note that any link without Motty-san's permission is prohibited. I will help you if you need approval. Ask webmaster. Text is all in Japanese. Mr. "EAGLE DX" 's site. Mainly focus into Hyakuri-Airbase. Text is all in Japanese. Mr. "OGA" 's site. Mainly focus into Gifu-Airbase. Text is all in Japanese. Mr. "DEE JAY" 's portal site. A lot of aviation site are linked. Text is all in Japanese. Many high quarity 3D models. Text is all in Japanese. JASDF Takaoyama-Radar Base's un-official site. Text is all in Japanese. Mr. "GREAT-BEAR" 's site. Text is all in Japanese. Mr. "Konta" 's site. Text is all in Japanese. Mr. "Okameinko" 's aviation model site. HEARTLAND Text is all in Japanese. Aviational designed T-shirt shop. Text is all in Japanese. Mr. "Beluga"'s site. Text is all in Japanese. Ms. "Spica" 's site. Good & Interesting photo reports. Text is all in Japanese. Hobby shop "ZoneX". Text is all in Japanese. Mr. "K" 's site. Photos for aircrafts, stars, and landscape. Text is all in Japanese. Mr. "YOUSUKE" 's site. JASDF, Digital Camera, Car(SUBARU WRX), Audio, Fishing. English menu is available. Mr. "Yamaguchi" 's site. Many model photos. Especially, I like his great work for TAMIYA's 1/32 F-15J ! Text is all in Japanese. Mr. "MAD" 's site. Many aircraft photos in Japan. Text is all in Japanese. Mr. "FUDOU" 's site. Many message boards are well categorized. Have fun! Text is all in Japanese. Mr. Watanabe's Gallery. Fantastic Digital photos! WELCOME TO SPOTTERS WORLD Almost all text are written in English. Mr. "Spotter" 's spotting site! Text is all in Japanese. Synforest Web Shop. You can buy Mr.Tokunaga's photo calendar. Text is all in Japanese. AIRBOX, the original video shop in Japan. You can buy historical Japanese airshow videos such as F-104J ! Text is all in Japanese. Mr. "BunBun" 's site. A lot of Information about Mitsubishi F-2A/B ! Text is all in Japanese. Mr. "Falcon" 's site. Plastic models, Patches, and Photos at Nyutabaru-AirBase. Text is all in Japanese. This is a Web shop for jet fighter's enthusiasts! Plastic models, DVDs, VHSs, Patches, and anything else! Text is written in English. Mr. Gianluca 's aviation patches site. Large amount of original patches from WWII to today of more than twenty Air Forces all over the world! Text is all in Japanese. Mr. "Keroyon" 's site. Mainly focus into Nyu-tabaru airbase which is the home base of AGR and 23sq. Text is all in Japanese. Mr."N1kei" 's site. Mainly focuses on Mitsubishi T-2 supersonic trainer. Text is all in Japanese. Mr. Ookawara's photo site. Air Show's photos, etc. Text is all in Japanese. Mr. "ADOK" 's site. Great collection of JASDF and flight goods. Text is all in Japanese. Mr. Watanabe's site. Almost all the special markings of 204sq were his work. You can buy decal of Mystic Eagles!! Text is all in Japanese. Mr. "Harry" 's site. A lot of Information for Komatsu-AB. You can also buy his great photos and patches! Text is all in Japanese. Mr. "OffSide" 's site. Aviation and motor-sports photos. Text is all in Japanese. Mr. "Elbow" 's site. Good shooting guide for Hyakuri-AB, and has a nice message board! Military-Goods shop "Kakita-shouten" 's site. English and Japanese pages available. Unofficial page of VFA-192. Text is all in Japanese. This site cheers T-4BlueImpulse Jr. , comical "Flight" Demonstration team of JASDF. Text is all in Japanese. Mr. "Eagle" 's site. Tons of amazing fighter photos using super telephoto lens! Updated ! Text is all in Japanese. Mr. "ELINT-nin" 's site. This site focuses on F-104J/DJ, for aviation enthusiasts. Holiday with Durum Semolina Text is all in Japanese. Mr. "Durum Semolina" 's site. Great JASDF fighter's photo with slow shutter! Text is all in Japanese. Mr. "NekoSuke" 's site. Amazing plastic models, and useful close-up photos. Text is all in Japanese. Mr. "Senkan-Mutsu" and "Raiden" 's site. Useful photo-shooting guide for Tsuiki-AirBase is here. Text is all in Japanese. Mr. "ben" 's site. Information and photos in Gifu AB. ARMING-AREA Text is all in Japanese. Mr. "CJ" 's site. Photos in Chitose AB and Chitose Air port. Text is all in Japanese. Mr. "Mayarah" 's site. This site is focused on F-15E. Text is all in Japanese. Mr. "YAS-3" 's site. JASDF, US Navy, USMC, USAF, and Japanese Jetliner's photos. Text is all in Japanese. Mr. "GAKU" 's site. Aircraft photo and his favorite Zippo collections. Text is all in Japanese. Mr. Numata's site. There are many model photos in "Aircraft room". Masa's DAILY PHOTO GALLERY Few Japanese text is in there, but you can see COOL photo taken by Mr. Masa at Nyutabaru-AirBase. This site updates daily. Text is all in Japanese. Mr. "MIWA" 's site. His favorite jet fighter is eagle. The main contents are text, but it is good. Text is all in Japanese. Mr. "Rokujyu-do no Kabe" 's site. His photos taken at Nyutabaru-AirBase, and very interesting Photo message board. Text is all in Japanese. Mr. "Hamp" 's site. Very good guidance and information for Hyakuri-AirBase, and his photos. Harby's Aircraft Photo Gallery Text is all in Japanese. Mr. "Harby" 's site. He takes Aircraft photos sisce 1950's-. There are all JASDF aggressor's F-15J/DJ pics. Text is all in Japanese. Mr. "Duck" 's site. There are many COOL RF-4E/RF-4EJ air to air pics! This site is not link free, but please feel free to ask me .